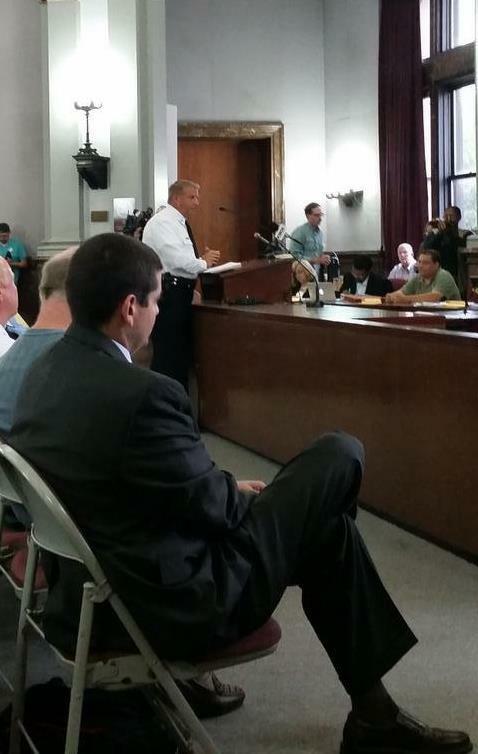 A packed hearing on a proposed civilian review board for the St. Louis Metropolitan Police Department erupted Wednesday night into a scuffle between supporters of the bill and its police opponents. Police and protesters scuffle after police union business manager Jeff Roorda allegedly grabbed a protester at a January 28 meeting of the public safety committee. Video from the hearing shows Jeff Roorda, the business manager for the St. Louis police union, grabbing a woman who was standing near him. The two groups quickly converged. Roorda left the room and did not return. Although the meeting eventually resumed, the outburst led committee chair Terry Kennedy to adjourn sooner than he wanted. He said afterward that the scuffle was emblematic of the deep divisions that still exist in the city. "Without addressing the underlying issues even here that has caused the behavior that we see here today, St. Louis will still be in the same place 10, 20, 30 years from now," Kennedy said. Ald. Antonio French, the lead sponsor of the civilian oversight board bill and the vice-chairman of the public safety committee, on Twitter called Roorda's behavior "deplorable and disrespectful to the fine men and women he is supposed to represent." The St. Louis Metropolitan Police Department said they were still awaiting details of the scuffle. Officers from the downtown bike patrol could be seen taking statements from witnesses after the meeting. The bill is the product of nearly nine years of negotiations, ever since Mayor Francis Slay vetoed a civilian review proposal in 2006. As currently written, it creates a seven-member panel that would have the authority to oversee internal affairs investigations of civilian complaints. The oversight board would also be able to do its own investigations if it believes the police's Internal Affairs Division falls short, and it can make recommend changes to the police department's policies. People who attended the meeting voiced tepid support to the measure, with some expressing indifference. "I'm pro what's going to move us in the right direction," said rapper Tef Poe, whose real name is Kareem Jackson. "I believe that there are a lot of good people in power. People have great intentions. I don't believe that Francis Slay has great intentions, I don't believe that Chief [Sam] Dotson has good intentions. And we can't address these things until we have a real conversation about that." Activist Jamala Rogers, who has fought for civilian oversight for years as the co-chair of the Coalition Against Police Crimes and Repression, called the measure an opportunity to pass something real. But she added that there was a lot of mistrust in the room of both government and the police -- especially of Mayor Francis Slay. "So we have to have an independent, effective, open process, accountable process, a democratic process," Rogers said. "That's what people are demanding." Several people requested that the seven civilian review board members be elected, rather than nominated by the mayor and approved by the Board of Aldermen. Chelsea Merta, a civil rights attorney who is running for the 7th Ward seat vacated by Ald. Phyllis Young, said the question for her was not the need for a civilian review bill, but the strength of the process. "If we aim to promote transparency, trust and confidence between the community and the police, we need to balance the scales of power and give more of that to the people.," she said. "This bill has no power and it has no teeth." The dozens of police officers in the crowd, many of whom were wearing green union shirts, were far from happy with the bill. "What should be an example of progressive and collaborative new approached to community engagement has instead become a manifestation of the simmering anti-police sentiments of some members of this board and this committee," said David Rudolph, a detective with the department. Officers who spoke after him expressed anger that they had not been at the table for the negotiations over the bill, and questioned whether the qualifications to be on the civilian review board were strict enough. Ald. Kennedy will need to schedule another hearing on the measure to allow aldermen to make amendments and vote. He said he heard a number of ideas from the audience that committee members are talking about, but did not elaborate further. Kennedy is working on a tight time table. The full Board of Aldermen has just four more meetings scheduled before adjourning for good in April. Unless the board suspends its own rules, it will take three of those four meetings to pass the measure. The Coalition Against Police Crimes and Repression is holding two forums on the bill. The first is February 5 from 6:30 to 8:30 p.m. at the Carpenter branch of the St. Louis Public Library. The second is February 12, also from 6:30 p.m. to 8:30 p.m. at the New Northside Conference Center. 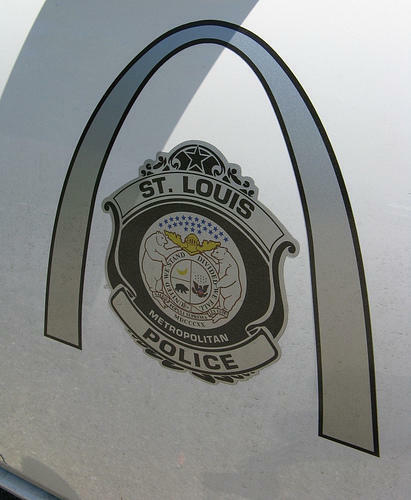 The city of St. Louis is looking to add two new levels of oversight to its police department. Public safety director Richard Gray announced today that he will ask the city’s budget committee to look into purchasing body cameras for the city’s 900 patrol officers to wear while on duty. Logistically, that would probably mean about 600 cameras. The new chief of the St. Louis Metropolitan Police Department says he wants to implement a civilian review board in the city of St. Louis. Sam Dotson officially took over as chief on Tuesday. The former operations director for Mayor Francis Slay replaces Dan Isom, who retired.